Chromatography is a common purification step in industrial downstream processing (DSP) of biological targets. A typical DSP scheme combines two or more chromatographic separation steps with ultra- and diafiltration unit operations to achieve the desired purity for the target. Due to their non-denaturing character, Ion Exchange, Mixed Mode, Hydrophobic Interaction, Affinity, and Size Exclusion Chromatography are the common modes applied in biopurification. 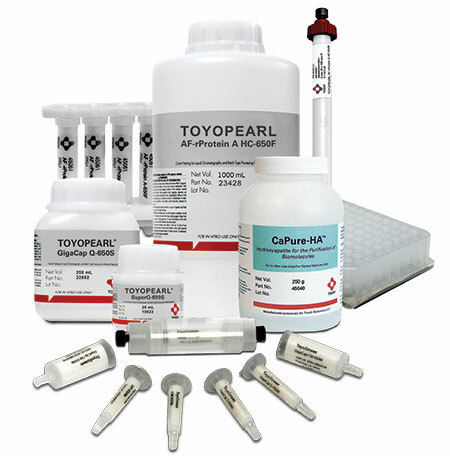 TSKgel and TOYOPEARL resins are specifically designed for use in biopharmaceutical production. Based on a rigid methacrylic polymer structure, they show excellent physical strength and flow characteristics, resulting in faster process throughput. Optimized pore diameters and narrow particle size distribution allow rapid kinetics and exceptional resolution.